Located at the centre of the lusciously green tropical forest, the Hanging Gardens of Bali overlooks the famous Ayung River and ancient Dalem Segara temple. This perfectly located resort boasts “the world’s best-swimming pool”, which is designed to overlook the picturesque, mesmerizing rainforest right underneath it. 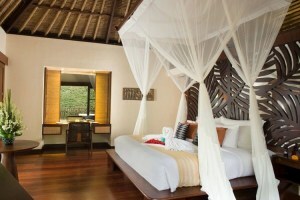 Designed to capture the harmony of the forest, each villa is roofed with the traditional Alang Alang thatched roof. Staying true to its Balinese culture, even the decor is traditional. The hotel is also one of the most spacious and well-equipped, making it an ideal destination for the perfect wedding location. Living up to the title of luxury resort, the spa treatment, which uses a combination of local, ancient and natural ingredients, completely rejuvenates anybody, soothing the mind, body and soul. A serene and harmonic environment surrounded by greenery. Lush greenery and the tropical rainforest surrounds the infinity swimming pool, giving you the feeling of tranquility at its best. Overlooking the lush green valley, make sure to carry your phone to get some amazing clicks. With a view of the renowned Dalem Segara temple and the “world’s best swimming pool” the dining experience in the garden is one of the most memorable and artistic. The dining experience here offers its guests a blend of contemporary, international and local culinary techniques, tantalizing each one of the taste buds. The ingredients for each meal come fresh from the market or from the in-site farms making food that much more enjoyable. Located underneath the restaurant, the partial open-aired bar and lounge offers the view of “the world’s best swimming pool” and Famous Ayung River’s valley. The drinks served here are a creative mix of cocktails and premium wines intensifying the exultation. With the fresh fruit garden available to its disposal, the bar offers an exotic variety to its guests. Dwell in a rejuvenating experience at the Hanging Gardens Spa or just enjoy traditional spa treatments at the riverside Bale: a unique spot where the Balinese jungle meets the rushing waters of the Ayung River. Relax and choose from the signature treatments and rituals, whilst the stunning views and the rhythmic sounds of the jungle and river stimulate the senses.